There are more memorable lines from This Is Spinal Tap that is someone tied to catalog them all, they would find themselves with a complete transcript. 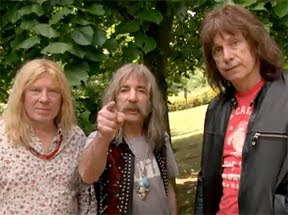 So it didn't take much more than a second thought to download Stonehenge: Tis A Magic Place featuring Nigel Tufnel (Christopher Guest), David St. Hubbins (Michael McKean) and Derek Smalls (Harry Shearer). With a short run just under eight minutes, you might as well be warned that the short will leave you wanting more just like the original film. Released in August 2009, it doesn't seem likely anyone will see the band back yet again. But fans can hope. A Quick Primer For Spinal Tap Newbies. 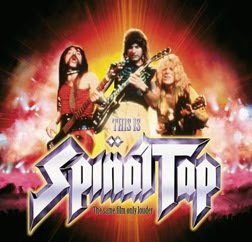 Spinal Tap is a stylistic parody of a 1980s rock band filmed and directed by the fictional Marty DiBergi (Rob Reiner). Except, documentaries don't always go as planned. For Spinal Tap, most concerts are cancelled; the cover art is scrapped for being sexist; and in staging a "Stonehenge" megalith, a mistake is made, producing a stage prop only 18 inches high. After a shaky start in theaters, the film captured a cult following that caught the attention of critics and the genre it parodied. Pete Townshend's 1985 White City: A Novel album included a quote from the movie; Metallica's black album was inspired by the film; and Aerosmith's Rock in a Hard Place prominently depict's Stonehenge. In 2002, the little film that could was deemed "culturally, historically, or aesthetically significant" by the Library of Congress. Here is an outtake from the original. A Few Notes About Stonehenge: Tis A Magic Place. It's hard to say whether someone who hasn't seen Spinal Tap will find this short funny. Regardless, it is a great 25-year anniversary gift for anyone who grew up with Spinal Tap. It's also amazing to think the short hasn't made it onto the Wikipedia page given the original release's proximity to the 25th anniversary campaign launched around the same time. Stonehenge: Tis A Magic Place opens with Nigel Tufnel and David St. Hubbins arriving in a shuttle bus to pick up Derek Smalls. The scene helps set up exactly why the characters were so enduring. Tufnel: "Well, he's always inside fighting with the missus." Hubbins: "He's an angry little man." Tufnel: "And so is she." The short then follows Spinal Tap on their journey to see the "real" Stonehenge. During the ride, they offer up their theories about Stonehenge, including that is was the first amplification system or a scale model of apartment buildings for Druids. Hubbins concludes that is what makes Stonehenge great. Even if you have read scientific journals, it can be anything you want. When they finally do arrive at their destination, Spinal Tap discovers that Legoland has been built up around the sacred site. While confused, they immediate benefit from the convenience of taking a little Lego train to Stonehenge. Stonehenge: Tis A Magic Place Rocks An 8.9 On The Liquid Hip Richter Scale. You won't find Stonehenge: Tis A Magic Place anywhere or everywhere. It was exclusively it on iTunes and not currently available. However, you can still find black album and Back From The Dead album. Stonehenge! 'Tis a magic place … Where the moon doth rise with a dragon's face … Stonehenge! Where the virgins lie … And the prayers of devils fill the midnight sky.